2009 (59) Plate. Vehicle was last serviced in November 2018, ERG valve, Brake Disks, Inlet Manifold were changed and DPF was cleaned. Vehicle has been in daily use, drives fine no issues. Partial Service History. Second hand fuel tank that don't leak (the old one was leaking when I brought the car). New ignition switch as old one failed. Rear windows need new window regulators. Passenger door don't unlock from fob (will unlock if you pull handle from inside common fault). MOT December 2019. 2001 BMW 525 i Sport. Generally presentable, there are a few bits of wear and tear worth noting. The engine pulls swiftly and strongly as you'd expect from any BMW 6 cylinder. The gearbox sets off and shifts smoothly and the car rides and handles exceptionally well. LOW MILEAGE.LONG MOT.SERVICE HISTORY.CLEAN AND TIDY. MOT until end of July 2019. 2003 BMW E39 530 d sport manual gearbox. Will need new front brake discs for next MOT. Car was previously an auto and converted to manual by the previous owner using a donor 530 d for all the parts. Very solid car but due to age it will need to be kept on top of, there is a small area starting on the os front arch for example. st August 1995 by my very good friends Fay & Andrew the car was treated like a princess and garaged every night and serviced as required. Call for any info. 5" crack in windscreen very top left hand side carnt be seen properly unless you are told were crack is as is in the tinted part of screen. Paint/laquer blemish on bonnet hardly noticeable. NO AGENCIES. Cash on collection only. 12 months MOT. Air conditioning. CD player with aux connector for mp3. But need to replace front bumper ,headlamp and bonnet but because of the cost of repair car was ritten off cat C.i have replaced fire rings in exhaust because on one MOT have fail on gas leak. 2001 BMW 540i SPORT AUTO AEGEAN BLUE INDIVIDUAL WITH BLACK ROOF. 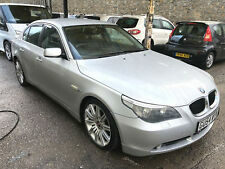 Stunning Low Mileage BMW 320D SE with a good spec and low milage. 80,000 Miles.